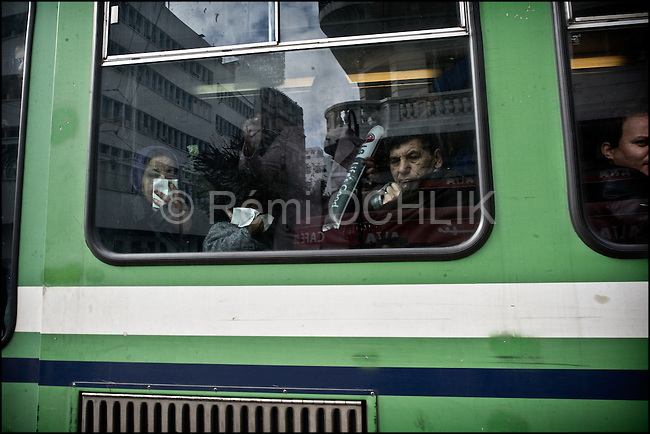 © Remi OCHLIK/IP3 - Tunis the 18 january 2011 In the tramway, tunisans people try to hide their face to avoid the teargazAround Bourguiba avenue, Tunisian protestors try to demonstrate, asking for the Ben Ali party, the RDC be disolve. Anti riots policemen spread tear gaz and beat them with their sticks..Tunisia took a step toward democracy and reconciliation Monday, promising to free political prisoners and opening its government to opposition forces long shut out of power -- but the old guard held onto the key posts, angering protesters..Demonstrators carrying signs reading "GET OUT! demanded that the former ruling party be banished altogether -- a sign more troubles lie ahead for the new unity government as security forces struggle to contain violent reprisals, shootings and looting three days after the country's longtime president fled under pressure from the streets.